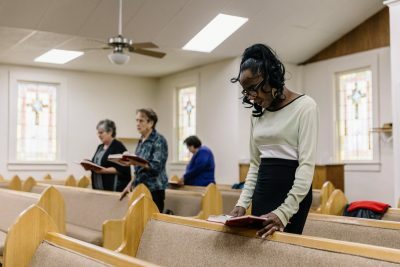 It’s a Sunday morning in late February at the tiny Baptist church atop the hill in Thebes, a remote village of about 400 people in the southernmost part of Illinois. I'm here for a story assignment, but to know people is to worship with them. Faith is as much a part of these small communities as the rivers that run outside their doorsteps. It twists a little tighter when the pastor calls the dozen or so people gathered that morning to lay hands on Laverne Williams because she’s about to lose her home, through no fault of her own. Aug. 23, 2015: The Southern Illinoisan details how, as public housing complexes deteriorated, some employees and managers of the Alexander County Housing Authority took home hundreds of thousands of dollars in questionable payments, bonuses, consultant contracts, retirement incentives and legal settlements in addition to their regular pay. April 10, 2017: In a heated meeting, HUD tells Cairo public housing residents they have to move. HUD explains the plan to provide residents with housing vouchers and moving expenses. Nov. 24, 2017: HUD files fraud complaint against ex-ACHA officials. Feb. 7, 2018: HUD tells Thebes public housing residents that they, too, must move. Earlier that month, officials from the Department of Housing and Urban Development called a meeting in Thebes to inform some 85 residents of two public housing complexes, including Williams, that they have to move out by the end of the year. I was at that meeting, too. I stood outside with residents as a long caravan of vehicles bounded over potholes and past weather-beaten homes. It resembled a funeral procession — the federal government arriving to bury yet another small town in my backyard. A year ago, I sat in a Baptist church in the nearby town of Cairo as HUD delivered similar news to 400 residents. This has been a long time coming. 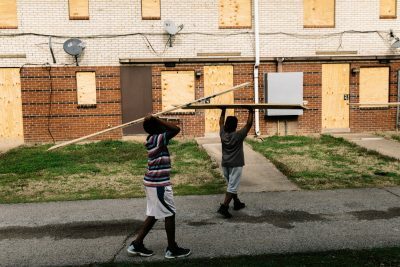 Housing complexes have been crumbling around families while the region’s infrastructure and economy collapsed. And it’s not unique to Cairo and Thebes. Public housing is aging across America. Federal officials are increasingly looking to shift people from housing run by the government to affordable dwellings that are privately owned or managed, and to encourage state and local governments to help pick up the tab. But some regions like ours lack the resources to replace what’s being lost. 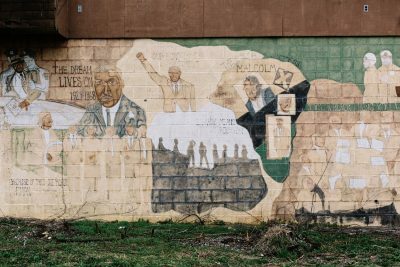 Cairo, which sits at the confluence of the Ohio and Mississippi rivers, is one of the most important African-American cities in the Midwest — a haven for blacks seeking freedom during and after the Civil War and a site of important demonstrations during the Civil Rights movement. Stubborn racial strife brought the U.S. Commission on Civil Rights to town in 1972. The late journalist Paul Good, known for his coverage of the civil rights era, authored a report the next year in which he painstakingly detailed the unfairness Cairo’s black residents reported to the commission. That included poor living conditions – chipping paint, roaches, rats, bad plumbing, cracked ceilings and walls — in their segregated public housing complexes, and HUD’s failure to enforce fair housing laws. In countless stories, The Southern Illinoisan has detailed alleged mismanagement and questionable spending by the housing authority’s past directors, and HUD’s failure to intervene. The federal housing agency is charged with regularly inspecting complexes and reviewing housing authorities’ finances. For years, HUD gave the county housing authority high marks. From the time HUD began documenting concerns in 2010, it took seven years before officials announced a plan to address residents’ living conditions. That plan: to ask nearly a fifth of Cairo’s citizens, and a fourth of Thebes’, to relocate. HUD has admitted that government agencies at all levels, itself included, contributed to the current-day Alexander County housing crisis. But HUD — the chief overseer — has been painstakingly slow to offer a detailed explanation of what led to its mistakes, and what has been done to prevent them in the future. Many here feel the agency’s response, though costly, is not proportionate to the agony those mistakes have caused. This year, The Southern Illinoisan is partnering with ProPublica to explore these questions — and try to answer them. Today, we are reporting on the lives and communities upended with the slated closure of complexes in Cairo and Thebes. In the coming months, I plan to report on other communities in downstate Illinois and elsewhere where aging housing has led to unsafe conditions. I will examine the quality of housing inspections and what happens when HUD takes over a housing authority. Given the ongoing push for privatization, which this administration is advancing even more aggressively, I also will look into the quality and availability of privately owned, HUD-subsidized housing, and barriers to finding adequate housing for Section 8 voucher holders. Residents like Laverne Williams have welcomed me into their homes to share their concerns and hopes for the future. In Cairo and Thebes, some were thrilled by the opportunity to receive vouchers and help relocating; others do not want to leave the only hometowns they’ve ever known. After church, Williams invites me back to the Mary Alice Meadows complex in Thebes. Her apartment is tidy and decorated with pictures of her family. As she makes us meatloaf for lunch, she talks about her feelings of uncertainty about leaving Thebes and the community she’s built here, and also about the struggles she faces in this remote village, which sits along the banks of the Mississippi River. She doesn’t have a car and can’t always get a ride to the store. Williams says that HUD’s decisions here are perhaps God’s way of letting her know better things await. It can be difficult to talk about where to draw the crooked line between holding on and moving on. Because home is a concept that beats a powerful pulse inside people. Because people lean on neighbors they know. Because it’s almost always minority residents forced to move, versus the opportunities coming to their communities. Increasingly, the latter is true for rural citizens, too, regardless of race. It’s a dilemma that families living in aging complexes have to wrestle with, as well as the towns in which they are located. It’s also a broader policy debate that HUD and Congress must answer as public housing complexes age. You are a resident living in HUD-subsidized housing that has problems (such as: heat doesn’t work, infestation, leaking ceilings, plumbing or electrical problems, mold or lead paint that hasn’t been removed). You have been forced to relocate from a complex that was closed because it was considered unsafe. You work or have worked as a HUD contract inspector or as an agency quality assurance inspector. You are a current or past manager of HUD-assisted housing. You are a housing advocate, community leader or citizen with concerns about a HUD-subsidized housing complex in your town. You can reach me via the following ways: emailing [email protected] or by texting or calling 618-924-0826.